Because erosion on Mars works more slowly than on Earth, features that are billions of years old can be preserved. This is especially true when an ancient feature (such as a crater) becomes buried by younger sediments. Sediments typically include dust, silt, and sand blown in by the wind. 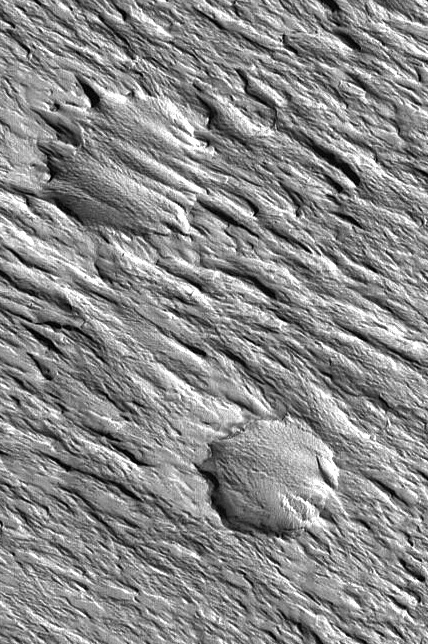 Impacts nearby can throw debris, usually partly molten, across craters in their vicinity. Sediments also include volcanic ash from nearby or distant eruptions, which falls from the atmosphere. And fine-grain silt or dust may mix with snow and ice to cover the ground, just as on Earth. A blanketing mantle of material rich in dust and ice would drape across craters of all sizes, giving the ground a softer, less angular look. Then as the climate changes, trapped water or ice may escape and leave the sediment as loose material. The wind (and wind-blown particles) can remove this covering material and gradually bring to light again an ancient feature, long buried. Scientists call this process exhumation. It's a bit like uncovering an ancient temple or ruin on Earth.